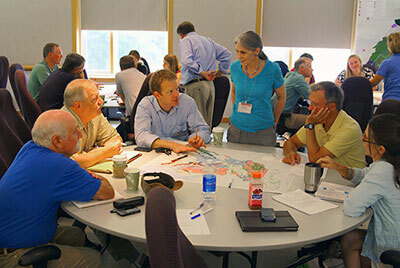 Partners discuss conservation issues at the workshop in West Virginia. The Chesapeake Conservation Partnership is a coalition of diverse organizations and agencies engaged in land conservation and related fields within the Chesapeake Bay watershed. Partners seek to extend the conservation of large landscapes throughout the region to benefit multiple values, including economic sustainability; scenic, historic and cultural heritage; working lands; important wildlife habitat; water quality and supply; and overall quality of life. The group bridges the connection between ecological, cultural and recreational resources. While conserving ecological resources is important, participants recognize that there are other reasons that compel individuals and organizations to conserve land or water, such as a cultural or recreational connection to the resources or because it is part of their heritage. The Partnership provides a forum and an opportunity for organizations and agencies to improve conservation in the Chesapeake by influencing policy and funding at a higher level. We work across jurisdictional boundaries using an action-oriented and non-bureaucratic approach to get work done. Partners set goals and share information collaboratively through dedicated work groups. The Chesapeake Conservation Partnership is jointly convened by the Chesapeake Conservancy and the National Park Service Chesapeake Bay Office.